The Stupid Shall Be Punished: MUCs For Everyone! I was confused a couple of days ago by an AP article that was posted on the WTNH-TV website in Connecticut about the workforce at EB being "commended" for their work on my old ship USS Jimmy Carter (SSN 23) -- the article said that the boat "holds the record for the fastest construction time", which is clearly a false statement. I figured I'd wait for more information before I wrote about it. I'll admit that this sounds like quite an achievement. The Meritorious Unit Commendation is supposed to be awarded to a unit that "distinguished itself, under combat or non-combat conditions, by either valorous or meritorious achievement which renders the unit outstanding compared to other units performing similar service, but not sufficient to justify the award of the Navy Unit Commendation. .. To justify this award, the unit must have performed service of a character comparable to that which would merit the award of a Bronze Star Medal, or achievement of like caliber in a non-combat situation, to an individual." (The actual instruction is here for those who are interested). So did SupShip Groton and PMS 350 distinguish themselves to this degree? Apparently they did, since they got the award. One thing that sticks in my craw a little bit, though, is this sinking feeling that the reason the boat was so quick from launching to delivery is that the Multi-Mission Platform was so late in actually arriving that the ship was much further along in construction than any other at the time of launch. My Engineering Department did one testing program that had never been done prior to launch by any submarine crew (with no problems, I might add). So, it seems to me that this was a rather convenient justification for the MUC that doesn't make sense if you look at it closely. Not that it affects my retired pay at all, but it would have been nice if they had mentioned the crew as being just a little bit responsible for all the kudos. Update 2115 17 Jun: Speaking of the Jimmy Carter, she just had a Change of Command last week. Dude, remember that a couple of years ago everyone at USNA got one. We conducted a 6-month NORLANT deployment, did well on ORSE, got the SUBRON 6 BATTLE E did not get ANY sort of unit award. Where is the justice? I remember being told as an ENS that it wasn't the deserving who weren't awarded that pissed sailors off. It was the awards given to those not deserving. So glad I'm not in DC. The only hope is that they will balance out by not receiving a future MUC when they deserve it. I received my first NAM for just showing up to work early and becoming the SOQ at CSDS12, so I didn't think it was deserved, but later I was definitely shorted a NAM on WestPac when my useless chief got it for "leadership" on his way out the door. I call it balance. Don't knock it when the Navy decides to give an award because you can't guarantee they will do it again when they should. You think this is bad? The Jacksonville (Fl) Naval Hospital was awarded a MUC early this year. Only problem, is that the CO of the hospital had just been relieved, and the hospital and several doctors/nurses charged in at least (to my memory) 3 separate malpractice cases, one which caused a death. You gotta wonder, just what the hell do these people think sometimes. 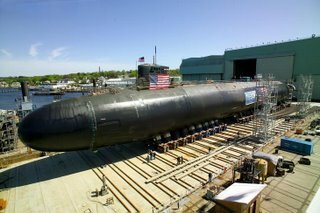 sounding the klaxon for my old boat ssbn 623 (nathan hale), we did receive the muc the same year we also took the "most outstanding boat for sublant in '78." and that was after being in drydock to repair the hull damage sustained back in sea trials (bremerton '75) when the ship took a wrong turn and plowed the beach (!) big time. imagine 4 years spent trying to regain your rep, but we did it. (i was xfered in from sculpin ssn 590 as relief qm lpo 3 days after the, ah, incident). "...which is a move that's sure to give us a winning advantage over the terrorists" is really funny, Bubblehead. An MUC for shipyard and SUPSHIP? I trained Dave Honabach as a JO. He was a bright light then, and he is a bright light now. I hope I never hear his name in the news until he is relieved after a tour well done. That will mean he has done his job, keeping both the nation, and the submarine force safe and out of the newspapers. He'll do a much better job keeping the country safe than the ship's namesake ever did. thats the most important award to me.